"I'll look in books and see almost no mention of Les. I don't think it's fair. Or right." "Throughout all (his various activities), Brown has maintained a strong jazz-oriented ensemble .... The principal virtue in all aspects of this [band’s] ... lies in utter relaxation. No one is straining and everything is totally musical, with technique available when required. This is mature professionalism at its best." Woody Herman, Stan Kenton, Count Basie and a slew of other big bands helped me pass many enjoyable days in my Ute [apologies to Joe Pesci] while I listened and practiced to their recordings. 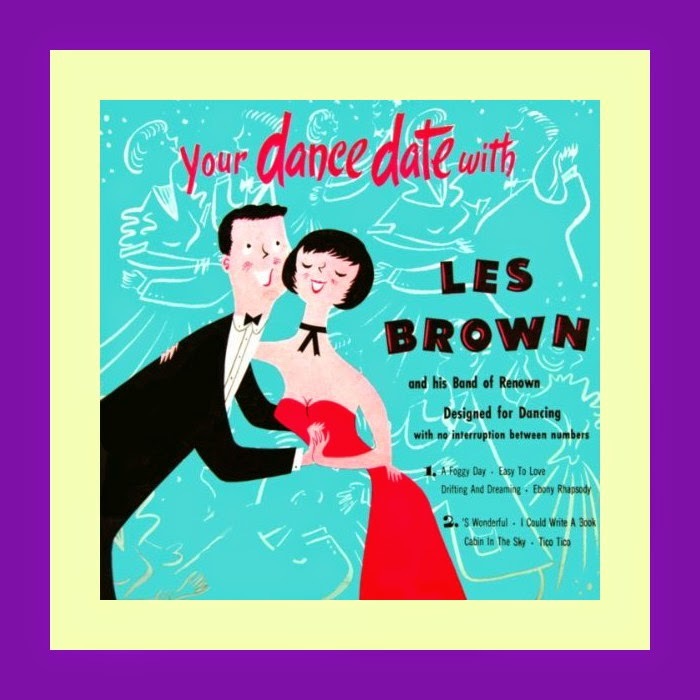 For awhile, my most favorite of the big bands was Les Brown and what he affectionately termed his “Malted Milk Band.” The nicknamed was derived from the wholesome and clean cut “look” of the band members, something that Les took great pride in, when they appeared in super clubs, on television and radio shows and at college proms. Most of these performances were generally in and around Hollywood, CA which I had ready access to thanks to a used car that I kept running with “bubble gum, band aids and bailing wire.” Gas priced at .29 cents a gallon helped a lot, too. The band was loaded with talented musicians among whom were Don Fagerquist on trumpet, trombonist Ray Sims, Abe Most on clarinet, saxophonists Dave Pell and Ted Nash, Jack Sperling on drums and it featured a book of charts by such stellar arrangers as Frank Comstock, Skip Martin, Bob Higgins, Wes Hensel and Boyd Raeburn. I was reminded of these halcyon days gone by when I recently uncovered [literally] some old copies of Gene Lees’ Jazzletter. The first of a two-part series on Les Brown and his band appeared in the June, 1996 edition. Carter — one of Les's heroes — led big bands as far back as the early 1930s, and is still active, though only intermittently with a big band. Business factors precluded his sustaining a big band for long, and he disbanded in 1942. A year later, one of his arrangers went to work for Les Brown and became an important factor in the band's success and continued high quality: Frank Comstock. Comstock, the principal arranger for the Les Brown band over the years, said, "I'll look in books and see almost no mention of Les. I don't think it's fair. Or right." Longevity of course is hardly Les Brown's main claim to notice. He led one of the truly great bands of that era, and a recent (May 10, 1996) performance at the Hollywood Palladium, taped for television presentation on PBS in August, shows how alive and well he and the Band of Renown actually are. This year is his sixty-second anniversary as a bandleader. Les is eighty-four. Composer and writer Bill Kirchner, who spent three years listening to post-World War II bands in the process of selecting big-band tracks for a five-CD collection issued in a boxed set by the Smithsonian Institution, chose for inclusion a Les Brown track, Pizza Man, a blues by Bill Holman with Frank Rosolino as guest soloist. In his annotation for the collection, Kirchner wrote: "Throughout all (his various activities), Brown has maintained a strong jazz-oriented ensemble .... The principal virtue in all aspects of this performance — Rosolino's soloing, Holman's writing, and the band's ensemble execution — lies in utter relaxation. No one is straining and everything is totally musical, with technique available when required. This is mature professionalism at its best." Part of the reason that Les Brown is semi-overlooked surely is that he is such a self-effacing man. He claims nothing for himself and nothing for his band, although it has been, year in and year out right into the present, an outstanding group. He once told George Simon that it was a "malted milk band", a perhaps unfortunate characterization that has tended to stick. Doris Day, when I talked to her about it, said it was "a milk-shake band," although she may have meant something slightly different by that. She said, "I don't think anybody in the band even drank." All you'll get from Les is his admiration for others. "What a band!" he said of that led by his late friend Woody Herman. After reading my biography of Woody, Les said, "Change a few names and it could be the story of my life." Well, yes and no. First let us consider the similarities, none of which had occurred to me until Les made that remark. For one thing, the bands of both men, in common with those of Duke Ellington, Count Basie, Stan Kenton, Harry James, and Lionel Hampton, outlived the big-band era. Yet when that era is discussed, it is usually overlooked that Les still leads his band, although rarely outside Southern California, where most of its members live. Like Woody, Les is a small man and, again like Woody, a very attractive one. His hair, and he has all of it, is now white. Like Woody, he is a product of middle America — Woody of Wisconsin, Les of Pennsylvania. Both played tenor saxophone in their early work as side men; both concentrated on alto and clarinet when they became leaders of their own bands, though Les never took a conspicuous solo role with his band, as Woody did. Artie Shaw once told me that saxophone players, himself among them, tended to take up the clarinet when they organized their own bands because it could be heard through the primitive sound systems of the time. Woody was extremely modest about his own abilities. Les is the same, devoid of pretense or presumption. But inside that self-abnegation you can sense a strength. Woody accurately evaluated himself as a great editor of the work of others, and Les has that quality too. For both, the band itself was always the instrument. Like Woody, Les can play the jester in front of an audience, though not so flamboyantly as Woody; but off-stage he too is a rather shy man. Both men, in common with Gene Krupa, were loved by sidemen and alumni. Finally, both married young and stayed married. If the similarities are many, so are the differences. Les was conservatory-trained; Woody was not. Les is a bookish man. I'm not sure Woody ever read a book in his whole life. Les is very cognizant of the classical-music tradition, perceptive of the whole range of the music's history, up to and including that of contemporary figures such as Pierre Boulez. He regularly attends the concerts of the Los Angeles Philharmonic. ("That has become a great band!" he said.) Woody was only partially so, and in awe of what he knew: he was forever dazzled that Stravinsky had once written a piece for him. Woody developed an astonishing number of jazz stars, more than any other bandleader in part because of the enormous turnover in young musicians. Les Brown produced far fewer, because of the stability of his band. When it comes together for its occasional gigs, Jack Sperling still plays drums in it. Les's kid brother, bass trombonist Stumpy Brown, has been with the band since graduating from military academy in 1943. "For reasons beyond my knowledge, Brown always featured in his band tenor saxophone soloists who had the most remarkable control of the instrument's upper range — and beyond. Indeed, an inattentive listener might easily assume the instrument being played was an alto or even a soprano saxophone. Wolfe Tayne, Brown's tenorman from 1938 to 1942, had that kind of exceptional high range . . . and so did Ted Nash .... Nash was one of that young generation of tenor players . . . who adopted the lean linear style and light sound of Lester Young with a vengeance. Nash's complete control of the third and fourth octaves of the tenor saxophone's upper register enabled him to expand dramatically the instrument's expressive range." Despite the presence of such soloists, what the Les Brown band was most noted for was consistently excellent playing of consistently excellent arrangements. Jazz fans divided the orchestras into "swing" and "sweet" categories, unsatisfactory designations in that the demarcation was not clear: "sweet" (meaning corny) bands such as those of Kay Kyser (one of whose arrangers was George Duning) and Sammy Kaye employed good musicians and could on occasion turn in creditable performances of the few "jazz" charts in their books. And the "jazz" bands played "sweet" ballads. Furthermore, all of the bands played for dancers. Indeed, a Jimmie Lunceford tune was named For Dancers Only, and Benny Goodman's theme was Let's Dance. Les, typically, claimed nothing. He never said his was a jazz band. However, if it was "only" a dance band, it demonstrated just how good "popular" music could be, what levels of excellence and high taste it could achieve. As Terry Gibbs put it, "You never heard Les Brown with a bad band." Gunther Schuller, in his book The Swing Era (Oxford University Press, 1989), wrote that the early Les Brown band "was decidedly inferior, and thus represents one of the most startling artistic-stylistic transformations in jazz history — an ungainly cocoon into a quite beautiful butterfly. "Brown's earliest recordings from 1936, and even those of his second band formed in 1938, drably arranged (by Brown himself), stiffly played, at best a weak imitation of Benny Goodman, do not suggest in the slightest the level of fine musicianship, technical polish, and healthy swing energy the band could muster ten years later. And once again, as we have noted before in other instances, the difference was made by the arranger. In Brown's case there were several excellent arrangers involved in the band's transformation, but it was Frank Comstock in particular who, beginning in 1943, turned the Brown band into a crack modern-styled ensemble." Superior writing came too from Skip Martin, Bob Higgins, who played trumpet in the band and wrote High on a Windy Trumpet and Lovers Leap, and Wes Hensel, a Cleveland native who had come to the band after working with Charlie Barnet and Boyd Raeburn. During more than ten years with the band he wrote, among other charts, Montoona Clipper, Flying Home, and Ebony Rhapsody. Schuller continued: "The first intimations of better things to come occur by 1939-40. One hears a considerable improvement over the earlier thumpy-rhythmed, thin-toned, and often out of tune performances, in Mary Lou Williams' arrangement of her Walkin' and Swingin' and such pieces as Perisphere Shuffle and Trylon Stomp, both written and arranged by Brown for the 1939-40 New York World's Fair (where Brown's band had one of its earliest long-term engagements). But a real break-through came in Ben Homer's clean, incisive Joltin' Joe DiMaggio of 1941, superbly played by the band with a fine two-beat Lunceford swing. There followed such fine scores as Bizet Has His Day (one of the few interesting, in this case even witty, transformations of classical material from that era); Nothin' from Ellington's Jump for Joy, in a clean, lean, swinging arrangement that anticipates the latter's I'm Beginning to See the Light of three years later; Sunday and Out of Nowhere in beautifully crafted arrangements featuring Billy Butterfield in excellent extended solos." "Indeed one of the miracles of the Lunceford band was that its performances had as much cohesiveness as they did, a cohesiveness second only to that of Ellington's and Basie's. And that unanimity, one feels, was not imposed from above by the leader, Lunceford, but came more out of the mutual respect among the chief arranger-architects of the band . . . . "
But that is not so. Rather then relying on what "one feels", Schuller could have obviated this gaffe with phone calls to such veterans of the band as Gerald Wilson, Snooky Young, and Al Grey. Al Grey says firmly that the band's coherence did come from above, and was imbued by the way Lunceford rehearsed and led that band: section by section in separate rooms, and, in performance, after tuning up each man individually. Lunceford was an arch-disciplinarian, but one who was enormously respected by his musicians. 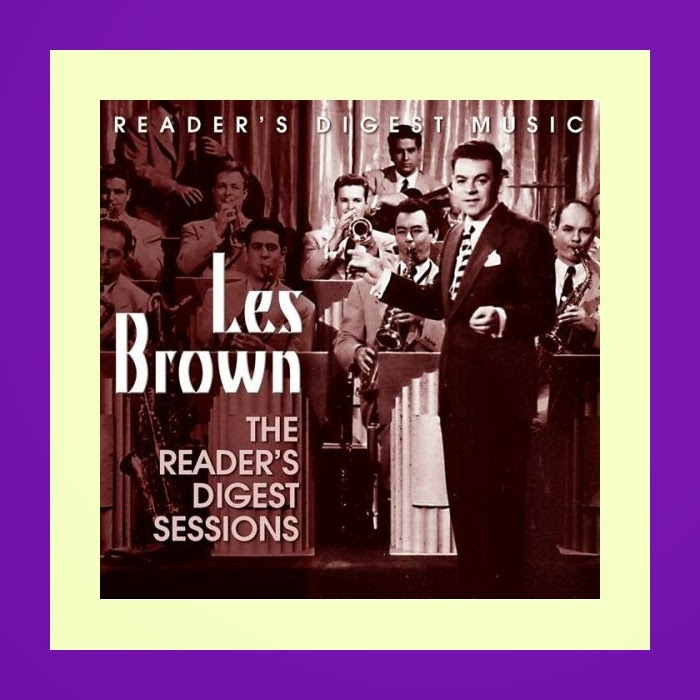 And the reason the first Les Brown band to be heard on records is not as good as the one that succeeded it is that it was, like Woody Herman's Band that Plays the Blues, a co-operative. Woody said that no decision could be made without a meeting of some sort, as often as not in the men's room at some gig. Les said: "Co-operative bands do not work. Ask Casa Loma. Ask Woody. Ask Johnny Long. That was another co-operative. He finally got rid of it. I finally got rid of it. I was so happy to make the change." Red Norvo never cared for the Band that Plays the Blues; he said he wouldn't even go by to listen to it. The Herman band began its evolution when Woody got control of it; and so did that of Les Brown. I put the question directly to Les: "Your bands were always in such exquisite taste,"
I said. "One of the keys was the writing. Was that because you're an arranger?" "I think that had something to do with it," Les said. "I always made sure that I hired arrangers who were a hell of a lot better than I am! And I sort of confine my arranging to vocal backgrounds. I did a lot when Doris Day was in the band. And I do it for the girl singer we now have with the band, Linda Price. I know my limitations. I write a jazz chart every now and then. Sometimes it comes off. If it doesn't, it comes out of the repertoire the same night we play it the first time. If I don't like it, I say, 'Hand it in!' "But sometimes I'd keep 'em and still play 'em." Frank Comstock said, "Les has always said that. He always said he was smart enough to hire arrangers who were better than he was and Abe Most because he was a better clarinetist and Ronny Lang because he was a better alto player. That's the way Les is." Les is a native of the beautiful hilly Appalachian coal region of upper eastern Pennsylvania, in common with trumpeter Fuzzy Farrar, a key figure in the Jean Goldkette band, and Spiegle Willcox, who played trombone with Goldkette when Bix Beiderbecke and Frank Trumbauer were in the band. He was born Lester Raymond Brown in Reinerton, on March 14, 1912. "My dad was a baker by trade," he said. "But music was what he lived for. It was pretty hard to make a living from music in those towns in those days. And he had four kids. He got married in 1911, and I was born the next year. He was also the town bandleader. Self-taught." His name was Ray Winfield Brown, and he was born in Orwin, Pennsylvania. The family background was Pennsylvania Dutch. Les was the oldest of the four Brown children, including their sister Sylvia and Warren Brown, who would one day play trombone in his brother's band and then become prominent in music publishing in New York. The youngest was Clyde Lamar Brown, who acquired the nickname Stump when he was in grade six or seven. This evolved into Stumpy when he became a professional musician. He was born September 1, 1925, in Tower City, Pennsylvania. His father taught him trumpet, baritone horn, then trombone, saying, "Baritone horns can't make a living. There are only two in every concert band." This little remark tells us that their father wanted his sons to be professional musicians. "They were beautiful people. My dad taught himself to play all the musical instruments. Trombone was his main instrument. When I was a young boy, he said, 'Y'know, one time I played first trombone over Tommy Dorsey. Of course, I was twenty-one and Tommy was twelve.'" The Dorsey Brothers too were from that part of the country, and their father, like Les and Stumpy's, was a part-time musician who taught music. Jimmy and Tommy were born in 1904 and 1905 respectively in Shenandoah, Pennsylvania; they were eight and seven years older than Les. These towns are at most twenty or thirty miles from each other, lying in the area's southwest-slanting valleys close to the Blue Mountains spur of the Appalachians. "My dad," Les said, "played trombone with Tommy and Jimmy and their father in Pottsville in the Third Brigade Band." Pottsville is about twenty miles south of Shenandoah. "It was a concert and parade band. Those bands were very popular in the '20s." Stumpy said, "I'm thirteen-and-a-half years younger than Les. I played in my dad's high school band. In the summertime, in a little town called Lykens, Pennsylvania, the teachers all worked nine months and then had their three months off. Dad would teach the band during the summer. Every fall, the band was always better than it had been at the start of the summer. It was a love he had. We always say that my dad probably taught every kid who ever played an instrument in what they call the Williams and the Powell valleys. One kid that I grew up with was Gil Mitchell. We started playing trumpet the same day when we were nine years old. He went into an Army band during the war, and retired as a Lieutenant Colonel. We still get together. I talked to him in April, on his 71st birthday. "I think my mother was sixteen or seventeen when they got married. She was not a musician, but she could play the piano by ear. And she could sing. She sang in the church choir." "There was a series of towns, between Pottsville and Harrisburg. Tower City, Orwin, which was close to Tower City, Reinerton, where I was born. Most of them had one main street. Or at the most three streets. Three thousand people, things like that. Now down to two." He was referring to the depopulation of the area with the decline of the coal industry. "And then Williamstown and Lykens. All the towns put together wouldn't be more than twelve thousand population. "It was sulphur coal mining, done mostly by Czechoslovakian and Polish people. One of my girlfriends at Duke University was from Aliquippa, Pennsylvania, where Henry Mancini was from. I told Hank about that once." The arranger Bill Challis, one of the architects of the Jean Goldkette band, the Paul Whiteman band, and ultimately of the big-band era, was born in that vicinity. Bill and his brother Evan told me a few years ago that the coal miners loved to dance, and the owners of the mines maintained private clubs that employed bands. "Bill Challis was born in Wilkes-Barre," I reminded Les. "Paul Specht was also from that area," Les said. "Fred Waring. I go back to the days of McKinney's Cotton Pickers, Paul Whiteman, and then the Casa Loma. They were my gods for a while, until Benny Goodman came along. I loved the Casa Loma band — and I loved the arrangements of Gene Gifford. And he wrote some nice originals, including the theme song, Smoke Rings. "And I loved Benny Carter. There's an unusual man. God, I love him! What a talent! I remember when I was in college, listening to his records on trumpet and saxophone. Then I found out he was an arranger and composer. What a musician." "Did you ever hear the Goldkette band live?" I asked. "Not live, but I had all their records," Les said. "Miller played with that band, and the Dorseys. Another band that made some good records was Ted Weems. They were more commercial. But every Friday they'd have the new releases on Brunswick and Victor. The store was right across from my dad's bakery and I'd go by and listen. I couldn't afford to buy 'em, but I heard 'em. Every now and then I'd beg my dad to buy one I really had to have. Fred Waring. McKinney's Cotton Pickers. Bix. When I first heard Bix's chorus on Sweet Sue, my God!" And he sang a couple of bars of that solo. "Do you know Spiegle Willcox?" I asked. "He's from just north of there in New York State. He's from Cortland." "When I was at Ithaca," Les said, "my friend Greg McHenry, a fraternity brother who became the head of the music school, played in the same band with Spiegle. Wes Thomas and his Cornell Collegians, which I played in — tenor sax — after Spiegle had gone out into the so-called entertainment world. He's still living." I said, "He's still playing. All over the world. I've been up to his house near Cincinnatus. Near Cortland." "When I went back to Ithaca, guest conducting the symphony, not too long ago, Greg called Spiegle to see if he could come down. I did the Prelude to the Third Act of Lohengrin at the commencement exercises. They gave me an honorary doctorate and all that. I'd been back to conduct before. And Spiegle came!" "Most of the guys who became bandleaders," I said, "began as side men with other bands. You didn't." "Well I did," Les said, "but never with a name band. I went to school from 1926 to 1936, the first three years at Ithaca Conservatory, now Ithaca College." The city of Ithaca, New York, on the shore of Cayuga Lake, is also the home of Cornell University. It is only a few miles north of the region where Les and his siblings grew up. "That was '26 to '29," Les continued. "Then I had to go back when I was seventeen and get my high-school education. I'd left high school to go to Ithaca Conservatory, from the time I was fourteen until I was seventeen, to study nothing but music — composition, theory, orchestration, whatever. And I was saxophone soloist with Conway's Band. Patrick Conway was second to Sousa from the turn of the century until he passed away in 1929. I played one summer with him at Wildwood. I was sixteen at the time. I had a hell of a lot of technique, I really did. "During the summer of '29, I met a guy who had been on ftill scholarship at New York Military Academy for two years, Bob Alexy, who later played with Jimmy Dorsey and Mai Hallett. His recommendation got me a scholarship, and I went there, as my brothers Warren and Stumpy did later on. Johnny Mandel went there with Stumpy. I was class of '32. Warren was class of '34. Stumpy was class of '43. We all finished high school there, on full scholarships." "Johnny said he knew your mother and father." "Sure," Les said. "He used to come to visit with Stumpy." I asked Stumpy about the academy. He said, "It's in Cornwall-on-Hudson, seven miles from West Point." Like West Point, the academy is on the west bank of the Hudson River, at that point flowing between great forested bluffs past Storm King Mountain, land that is rich in Dutch history, names, and legend. "That's beautiful country," I said. "Especially in the winter, when you froze to death," Stumpy said with more or less mirthless laughter. "I was the leader of the academy dance band. Johnny Mandel wrote arrangements for us and played trumpet in the band. We'd hear a record and want to play it, but there was no stock on it. Johnny would sit down and take it off the record. He was sixteen." "Was it a strict military academy?" I asked Les. "But it was a free education. I'll bet, with the train going home, buying uniforms and books, having a full scholarship, I spent only about $600 in three years. Of course those were 1930s prices. Still, it cost my parents $600 for me to live for three years. It was better than if I'd been at home. "We had four fraternity houses at military school. We used to play bridge or hearts. Come 7 o'clock, you studied or you went to bed. You couldn't be outside of your barracks from 7 until 6 the next morning. "We used to sneak over to the fraternity house at night, when we were supposed to be in bed. We'd find out from the New York Times when Paul Whiteman was going to be on the radio, or even Mickey Mouse bands. Whatever bands. Especially Whiteman and McKinney's Cotton Pickers. Or the band coming in from Chicago, Isham Jones. In those days, stations had a hundred thousand watts. I loved that Isham Jones band! Golly. Later on, I made some arrangements for him." I mentioned that Will Hudson wrote Jazznocracy based on the style of the Casa Loma. "I think that band was more influential than is generally recognized," I said. "I know it was with me," Les said. "I'd go down to Hershey Park during the summer, if I was home, and just stand in front of the bandstand all night with my mouth open, listening to them. "I was supposed to go to the University of Pennsylvania. In those days, during the Depression, they were begging for students. I was playing tenor in a band up in Boston, a week at some park. The Duke Blue Devils was the logo for all the university's athletics, including its football team — and the band was under the direction of a football player called Nick Laney, a very good halfback. In those days Duke had a great football team, with Ace Parker and Freddie Crawford. All-Americans. So the band too was called the Blue Devils. They came out one night to hear our band, and found out that I was getting ready to go to college, and they talked me into going to Duke." Duke University, in Durham, North Carolina, was founded in 1924 — built on a foundation of Trinity College, established in 1838 — on a grant from James Buchanan "Buck" Duke, one of the scions of the Duke family, which at one time controlled most of the tobacco trade of the United States. "They had two campuses, the east and west campuses," Les said. "The east campus was the ladies' campus. It was a very strict college. In those days, if you got married you were thrown out of school. Unless you kept quiet, and a lot of them did. "The reason I went there was that the Blue Devils played for an hour every night between 6 and 7, and for that you got free room and board. Again, it was 1932, the Depression; I was twenty. So my dad didn't have to put up room and board. We used to play enough gigs to make ten, fifteen dollars a week. That would buy as much as a hundred and fifty does today. You know what tuition was at Duke? Two hundred a semester, four hundred a year. "So I went to Duke. I got down there, and there was no music school. Of course I had finished music school. So I majored in French and minored in history. I liked history and I loved languages. I studied Greek and German. I'd had Latin in military school. And French. I took four more years of French. I can still read it, but I can't speak it now. I wish I'd done more of it. Or taken business administration. Although to this day, business bores me. "Remember Johnny Long? His was the other band there. He was at Duke at the same time I was, a year ahead of me. He was class of '35, I was class of '36. "Now Nick Laney didn't know a note of music. He was a nice guy. Good football player. Had a pretty good voice and he sang through a megaphone. And we'd play for fraternity dances, or for concerts. We had four brass, three trumpets and a trombone, and four saxes. Three rhythm, sometimes four with guitar. The instrument you could never hear, because there was no amplification. But you could feel it. "I played in that band at Duke for two years. Nick Laney finally had his four years of football. Still a sophomore! He had a full scholarship of course, too. He left school. He loved clothes, and he dressed beautifully. He went down to Spartanburg, South Carolina, his home town, and started a clothing store. Became very successful. And I inherited the band. In September, 1934. So I've been in the band business for sixty-two years!" "What did that Duke band play?" I asked. "Stocks?" "No. Every now and then they'd publish something like Fletcher Henderson's arrangement for Benny of King Porter Stomp. Even Spud Murphy stocks. But I wrote a lot for that band. All the popular tunes of the day, I arranged. And copied. I still do it the way I did in college. Now and then I'll write out a full score. Otherwise, I just do a sketch and copy out the parts myself, because nobody can read my writing. My handwriting is bad enough, let alone my notes. And sometimes I'll change my mind while I'm doing the copying. The guys have gotten used to it. "I graduated June 10, 1936." "I played trumpet in that band, although by then it was called the Ambassadors. I had a quintet called, would you believe it, the Five Dukes. "Patrick Williams and Sonny Burke both went to Duke." After graduation, Les said,"We did some one-nighters. We had a gig in Richmond, Virginia. Then we got a job in Budd Lake, New Jersey. It's about 40 miles inland from New York City, toward Delaware Water Gap. We played there from July 4 till Labor Day. I met my wife there. She was then Claire De Wolfe. She was dating a third saxophone player with the Duke band. When we came back to that location in the summer of '38, he wasn't with the band. He'd gone home to Baltimore and got married and started raising a family. I met her mother and dad, I knew her two sisters, they used to come to gigs. "On Saturday night, after we finished playing, some of us would head for New York and 52nd Street, just young kids right out of college. We'd make a weekend out of it, because we didn't have to be back until the gig Monday night at 8 o'clock. "One Saturday night, I told Claire, 'Three of us are going in to New York to hear Basie. We have room in the car, do you want to come?' She said, 'Well, my parents aren't here.' I said, 'Don't worry.' I was very friendly with her parents, who were quite young, in their thirties. They'd married awfully young. I called her home and spoke to her grandmother. I said, 'Tell Ed and Bess that I'm taking Claire in to New York and she's going to be staying with so-and-so. We're going in to hear Count Basie.' I was twenty-seven, she was twenty. She was no baby, although she looked like one. She still does. "That was our first date, although I'd known her for a while. Until then, I was sort of her big brother and confidant. A month later we got married at Lake Mohawk, New Jersey. Her two sisters still come out and visit us and stay with us. "By a coincidence, a lucky coincidence, a guy named Bob Stevens from Decca Records saw a bunch of cars, heard some music, came in, and we had a record contract. The first college band that ever recorded for a major label. I had graduated. I was the only one who had. No, the drummer too." "We played Ohio, Pennsylvania," Les said. "We played Cleveland. We'd stay two or three weeks at a time. The guys were making $60 a week. Not bad in those days. They thought it was great. And they were having fun. We ended up at Playland in Rye, New York, in the summer of 1937. "And then the parents got after them. 'Hey. Get back into school.' And rightfully so. And as I said, it was a co-operative band, and co-operatives don't work. That was the end of it. "I went into New York, free-lance arranged for a few months. I had a four-arrangements-a-week gig with Rube Newman, who was playing the Rainbow Room. Four for seventy-five bucks. I was pretty fast too. They had a Tuesday rehearsal. I wouldn't start till, say, midnight of Sunday, and keep arranging until I fell asleep around eight in the morning. I'd write on Monday, and I had a copyist right next to me, and we'd just make the rehearsal on Tuesday. The rest of the week, I'd go to the movies, or write a stock. Or whatever. "There was about eight months, between September and July, when I didn't have a band, the only time I haven't since I took over the Blue Devils. I even inherited the Ford the band had, because nobody else wanted it. "Then, after that eight months, I went back to Budd Lake with a band, then into the Hotel Edison." "Had you made up your mind you were going to have a career in music?" "I think what made up my mind," Les said, "was the Decca contract. And even though we didn't sell many records, we got pretty good write-ups, and it was a pretty good band. And one thing led to another. At the Edison, we were on NBC six nights a week, Monday off. We had a contract for four months. "I got married a week before we opened at the Edison. The first gig out of the Edison — here I am with a twelve-piece band — and inasmuch as I had gone to school in Ithaca, I knew the guy who booked the bands at Cornell for the junior prom. That was the big social event of the year in that town of twenty-five thousand. Everybody in the school went to it. "This was 1938. Here we are. They had three bands that night. Me and my twelve pieces here. Jimmie Lunceford over here, and Duke Ellington over here. On three different bandstands at Drill Hall. "I tell you! Was I chagrined! It was awful. They were playing things like Jazznocracy Les sang some licks at fast tempo. "They were trying to outdo each other, and here we were, playing our little dance music. I felt caught in the middle between those two great bands. "But we went on after that. We struggled and struggled. We did a lot of records for Victor, for their Bluebird label. Thank God they haven't re-released them. They weren't up to what they should have been in '38, when you had great bands like Artie, and Goodman. Or the Dorsey Brothers. Our records weren't that good. "We still had three trumpets and one trombone. Gradually I added more trombones, I added another trumpet. When we were up at Armonk, New York, the whole summer. We were on the air seven times a week. Six at night and Saturday at noon. "Glenn Osser and I lived together that eight months I was freelance arranging in New York. I learned so much about modern arranging looking over his shoulder, more than I did at music school, which taught classical orchestration. "That Saturday broadcast was big. I'd tell the band to be there at 11 to warm up. We'd go on the air from 12 to 12:30. It was our best shot. One time, I wondered where the engineer was. We had a booth there, because we were on every night. It was put in there by WOR. At ten minutes to the hour, I called the station. I said, 'Hey. No announcer and no engineer? We're all here ready to go. Are we off the air?' And the guy said, 'No! You're on!' I said, 'What do we do?' He said, 'Break the lock on the booth, go in and set the dials at 50.' They ran from 1 to 100. He said, 'You do the announcing.' So I did it. "We played the World's Fair in '39 for Mike Todd. And we went into the Black Hawk. We were hired for a month, stayed four months. But it wasn't till 1942 that I made any money. "I had Si Zentner on trombone, Abe Most on clarinet, Don Jacoby on trumpet, Wolfe Tannenbaum (who changed it to Tayne) on tenor. It was a good little band. Then I started losing guys to the army. "Eli Oberstein at Victor gave up on us, and rightfully so. Four months after the Black Hawk, our records started to sell, and we had a hit on Joltin' Joe DiMaggio. Vocal by Betty Bonny. She married Mort Lindsey. Good musician, good arranger. They live out in Malibu. We still see them now and then." "And when did Butch Stone join you?" "I said, 'We're going into the Black Hawk in Chicago in September. Would you like to come?' And I said, 'I also need a drummer. I'd like to have Irv Cottler too.'" Henry (Butch) Stone was born in Trenton, New Jersey on August 27, 1912. Thus he is a few months younger than Les. His parents moved to New York City when he was an infant, and his speech (as well as all the vocal records he made with Les) reflects that cultural conditioning. One of his first jobs was delivering film for one of the studios in the early 1930s. He played saxophone part-time in a band with other semi-pros, one that copied Jimmie Lunceford records. 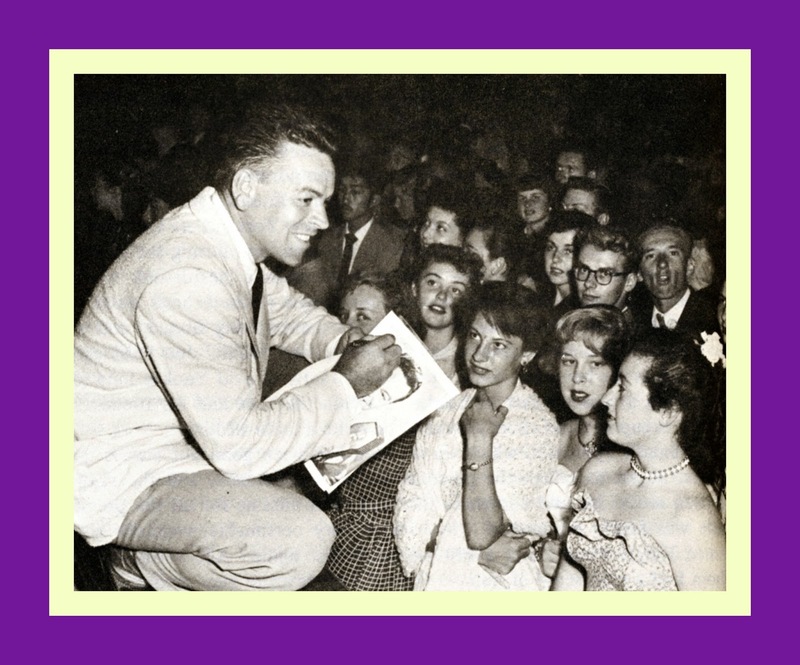 Butch did the numbers that Trummy Young sang with the Lunceford band, and gradually he gained acceptance as a comic singer, occasionally being referred to as the white Louis Jordan. 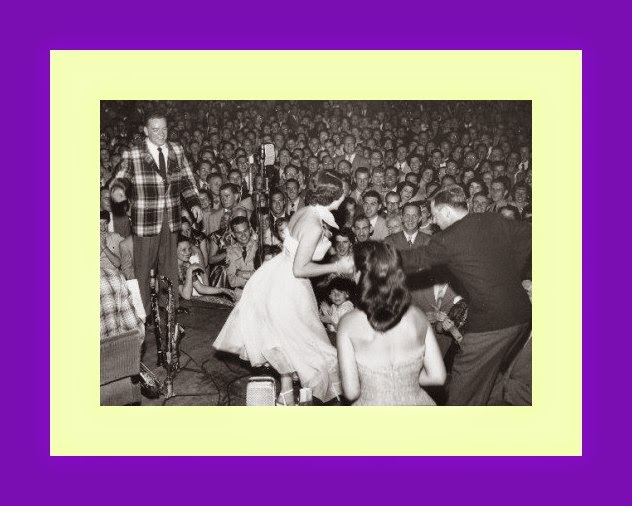 "A lot of the bands had guys who could step out of the ranks and do a song, usually a comic song, like Louis Prima with Tony Pastor and Tex Beneke with Glenn Miller," Butch said. I'd never thought about this before, but now that Butch mentioned it, I saw the pattern. Ray Nance with Duke Ellington, Hot Lips Page and Tony Pastor with Artie Shaw, Nappy Lamarr with Bob Crosby, Sy Oliver with Tommy Dorsey and Roy Eldridge with Gene Krupa all filled the same role. Shakespeare understood the principle, as witness the gatekeeper scene in Macbeth, and even classical composition observes it, as in the Stravinsky Firebird and the Sibelius Seventh Symphony. Even the "sweet" commercial bands had people to provide this comic relief, filling that dramatic function of breaking the mood as a preparation for serious material to follow. It's a sound dramatic principle. Even the "sweet" bands observed it, for example Ziggy Talent with the Vaughan Monroe band. Ishkabibble, in "real life" a trumpet player named Merwyn Bogue, held this position with Kay Kyser. "The bandleaders loved guys like Butch Stone," Johnny Mandel said. "They could distract an audience, and the bands were expected to put on a show." If it was an era of great ballads, it was also an era of novelty songs, some of them witty and some of them only silly. But they were part of the time, A Tisket a Tasket, Three Little Fishes, Mairzy Doats, Daddy, The Boogie-Woogie Bugle Boy, Pistol Packing Mama, Shoo Fly Pie, and The Frim Fram Sauce constituting a small sampling of the juke box triviality of the time. Les was going to add a baritone to the saxophone section anyway, and if he could find somebody who could also do novelty songs, so much the better. Butch perfectly filled the job description, as they would say in a later time. Butch recalled: "Les told us to go up and see Joe Glaser, who was booking the band. He was a big man in the business. He had a lot of acts that played the Apollo, including Lionel Hampton, and he handled Louis Armstrong. He had an office around 57th and Broadway. On the way over, Irv Cottler and I said we wouldn't take a penny less than a hundred and twenty-five a week. When we got there, Joe Glaser said, 'This band is going places. It's not a band of stars. Everybody gets the same money — seventy-five a week." Butch laughed, remembering. "I said, Til take it.' Irv Cottier said, 'I won't,' and left. He went with Claude Thornhill." Les said, "I got him later, after the band made a little more money and we were playing the Meadowbrook and Glen Island Casino and the Cafe Rouge." "Adding baritone saxophonist, how much did you rewrite?" "At that time, the baritone usually just doubled the first, although we don't do that so much in the newer arrangements. Up till then, he just doubled the first sax." Butch became a mainstay of the band, the dependable underpinning of the sax section and the resident jester, with a flair for singing comic songs, more or less on one note, including Robin Hood, Time Will Take Care of You, and a parody on etiquette lessons in which all the wrong things are advocated, Thank You for Your Very Kind Attention. Another song asserted: "Jack, I'm comin' back in my convertible Cadillac." In 1942 Butch and the band recorded A Good Man Is Hard to Find, a 1918 song associated with Bessie Smith. It became a hit. "Butch was the road manager," Stumpy said. "He was always mother hen to the guys, trying to get them good seats on the plane and that kind of thing. He'd go to the ticket agent and say, 'Look, the band has all these instruments and carry-on luggage. Why don't you let us board first and get settled?' And they'd agree. Butch would then count everybody, to be sure everybody was there, and then yell, 'Yo! Les Brown band! Let's go! "He didn't do it, of course, but he stopped naming us. He'd just say, 'Yo, band!' He still does." To which Butch said: "If the musicians are happy, it will be reflected in the music. So when we'd be going through some little town and stop to get something at a diner at three in the morning, and there'd only be a cook and one waiter, I'd go behind the counter and wait on the band. It was just fun. Later, when we started flying, I'd try to see that they got good seats on the aisle or at the window." This went neither unnoticed nor unappreciated; and so pervasive was Butch in the life of the band that some people thought of it as the Butch Stone band. He was a nurturing figure to other musicians. This led to his being named the Mother of the Year, an obvious pun, a few years ago. One of the band's hits was Bizet Has His Day. "This was during the fight between BMI and ASCAP," Les said. "And we had to go to PDs." He meant songs in the public domain.